Whether you’re already well acquainted with SEO and UX, or you are only just starting to understand what these tactics can do for your business, you may not know the powerful link between the two. A more holistic approach to the way you design your website can benefit your SEO by accommodating for both human visitors and search engines alike. 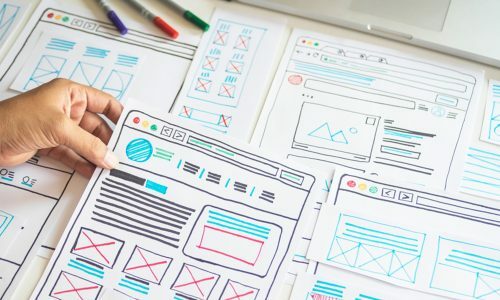 By leveraging the tried-and-tested tools and strategies of User Experience (UX) when incorporating SEO on your website, you can improve both your ranking and overall customer experience. You know when you walk into a shop, restaurant or building and you feel immediately at ease? Or perhaps you’ve spoken to someone recently and the conversation simply seems to roll on smoothly, without any awkward pauses or misunderstandings. These spaces have been carefully designed and furnished to elicit this feeling, and the person you talked to is likely well versed in the art of conversation. A good website UX should feel exactly like this. Consider it the Feng Shui of websites, if you’d like. User experience, or UX, is the careful design of a website to make it as easy and enjoyable for the user to navigate as possible. It encompasses the careful tailoring of colour schemes, button sizes, wording, links, images, video, loading speed and many more factors to create an easily navigable, great-looking website that inspires engagement. SEO, or Search Engine Optimisation is simply the process of helping Google help you. Google reads (or crawls) countless websites every day to be able to make split second decisions on whether your site is relevant to someone’s search. The more relevant it is, the higher up in the search engine results pages (SERPs) you go. If you need an upholsterer in Melbourne, hairdressers in Brisbane will do you no good, so Google’s algorithms won’t display them to you. If you run a business and Google doesn’t know what you do, chances are it’s not going to send you to the top of the search ranks. And that’s where you want to be to get the most traffic to your site. That’s where SEO comes in. SEO is about courting the Google algorithm by following its set rules (these rules also change frequently). A big part of this process is writing compelling unique, high-quality content that champions your key services, in addition to the top problems your business can solve. Google cannot read images, videos or other beautiful additions to your website (yet!) – it can only read text. That’s why it’s important to adhere to the search engine’s best practice when writing your content, while still making it an enjoyable read for potential customers. The implementation of SEO optimised website content is likely to see your business make a jump in Google rankings – which is essential when considering that most potential customers don’t click past the first or second page of searches. Have you ever found yourself in a restaurant wanting to go to the toilet, and you’re unsure whether the door ahead of you is the restroom or leads straight into a bustling kitchen? You may ask someone or perhaps you pass on going at all – either way, it’s a less pleasant experience than a clear and obvious toilet sign guiding you from the start. The click fear works like this. It’s simply the fear of clicking a button, because you don’t know what will happen next, or what page it will lead to. Using tried and tested UX strategies for eliminating the click fear, combined with SEO strategies to attract more traffic, is likely to increase click-through rates and potential sales. If a restaurant is backed up, the service is slow, and they don’t have a table for you for another 45 minutes, chances are you’ll head out the door. Well, did you know that most people exit a website if it hasn’t loaded in two seconds or less? People demand more from the websites they visit than ever before, and a site that’s slow is likely to have your customer heading straight to your competitors. There’s a number of things that can be done to amp up your loading speed, such as making sure images are at the optimal size and keeping self-hosted videos to a minimum. Your Google rankings are heavily affected by loading speed, so ensuring your website is as fast as possible is key to effective UX. DIY or seeking the help from a professional? For the computer savvy business owner, there are a number of things that can be done to improve SEO through implementing UX strategies. However, if you’ve tried a few tricks and it doesn’t seem to have had an impact on the business you receive through your website, seeking the help from UX and SEO experts who know their way around the most up to date algorithm rules can be the boost in traffic your business website needs. Contact our team of online solutions advisors to see how we can help.